Starting this week, we’ll be posting regular updates from our friends at the Juneau Police Department, about all the exciting 2017 Year of Kindness (17YOK) projects going on throughout the city. Occasionally, we’ll also bring you a few longer-form updates on extended projects and campaigns that the department and citizens have put together — stay tuned! 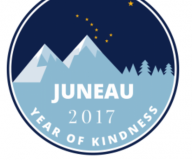 Juneau, Alaska’s 2017-Year of Kindness (17YOK), kicked off with the new year! About 60 people dropped by the first official event of 17YOK (2017 Year of Kindness). The gathering was at Sandy Beach on Dec. 31, 2016. There, participants wrote down negatives they wanted to leave behind, shared food, roasted marshmallows, and enjoyed performances by the Yees Ku Oo (New Beginning) multi-cultural singing and dance group. Member Nancy Keen was one of the drummers, along with junior Officer of Kindness and drummer Thea Duncan. JPD Officer Kevin Fermin wrote down some negatives to leave in 2016, as did Jennifer Jozwiak. The next day, on Jan. 1, 2017, the first day of the new year, about a hundred people came to the Auke Recreation Area for a polar plunge (where willing participants jump into an cold body of water) and to leave behind the negative. At both gatherings, socks were collected so that JPD officers could give out socks the first Saturday of each month during 2017. About 60 people dropped by the first official event of 17YOK (2017 Year of Kindness). The gathering was at Sandy Beach…. One person said that, rather than keeping to themselves, they reached out and had a genuine conversation with a man in the coffee line. Learned about his family and how his holiday went. A woman left a cup of cocoa and a breakfast burrito near a sleeping homeless man so he would have breakfast when he woke up. Thanked the cook at a lunch counter for making me lunch. Someone spoke at a community story-telling gathering called “Mudrooms”. The theme was letting go, discussed letting go of the negative to try and inspire others to do so. One person packed up a ‘to-go’ lunch from a meeting where there was leftover food. Gave the covered plate to a cab driver working outside. Remember: even the smallest, most insignificant acts of kindness—such as loaning a pen or allowing someone to go ahead of you at the coffee shop—can mean the world to someone else. Get inspired by the people and officers of Juneau this week and let us know how you got kind!